When we started to look at different ways on how our users can discover, save, and revisit content more easily, our first initiative was to look at how one can save web content, more intuitively, and more delightfully. 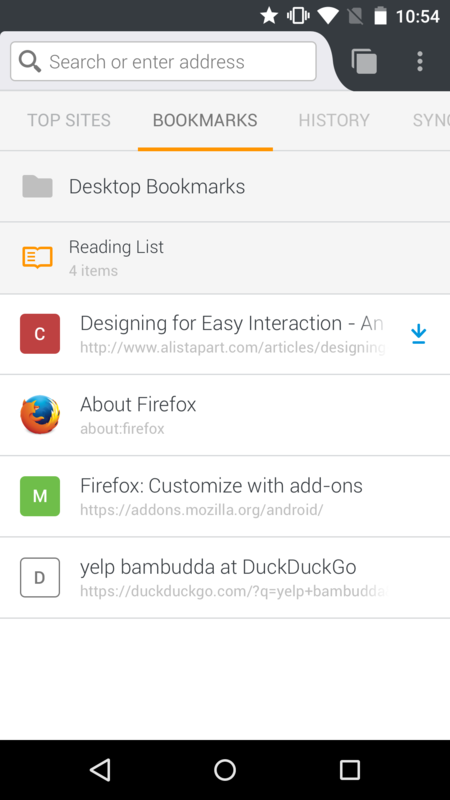 One of the most used and discussed features in the Firefox for Android app is “Bookmarks”, the concept of saving websites to be retrieved at a later time again. We currently provide several home panels. One of these panels is the Reading List panel. It’s a panel that, by default, is several swipes away, located at the very far right of all the panels. We believe it deserves more prominence than that, and therefore should be brought closer to the user. We want to help our users explore easier ways of saving and revisiting content, especially when being offline. 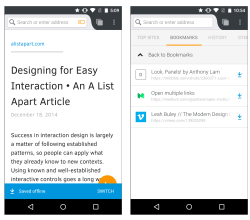 User research implies that users don’t fully utilize the potential of articles viewed in Reader View nor know how it relates to the Reading List. In order to consolidate and simplify the home panels, we will shift existing Reading List items such as articles, blog posts, etc. into the Bookmarks panel, and take out the Reading List panel. 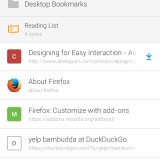 By converting existing Reading List items into Bookmarks, all saved articles will now become available for syncing across all Firefox account devices, a benefit we’ve been wanting to bring to our users for a long time. 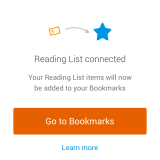 Existing users of the Reading List will receive a migration notification how and where to now find their existing Reading List articles. We will not only make Reader View more discoverable by restructuring the panels, but also improve the way users can learn about Reader View and its offline capability. This will be done by an initial helper UI as soon as a user saves a Reader View item for the first time, as well as further contextual hints if a user repeats the action of viewing these items. We will provide one easy way to save and revisit. 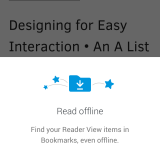 No need to decide how to to save web content anymore, whether it’s by touching the Reading List icon within Reader View or touching the Bookmark star button. Now, any link will be saved by touching the star button. 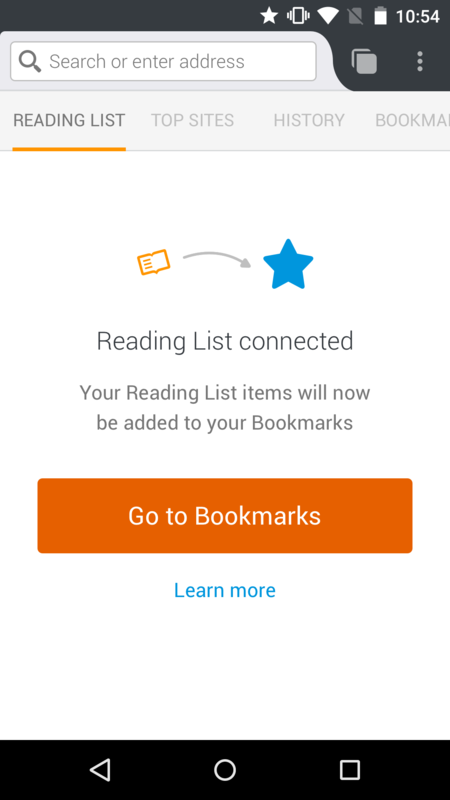 In addition to saving Reader View articles to the Bookmarks list, these items will also automatically appear in a new Reading List smart folder. The idea of a smart folder is to organize content for our users, based on context and type (similar to the smart folder on Desktop called “Recently Bookmarked”). 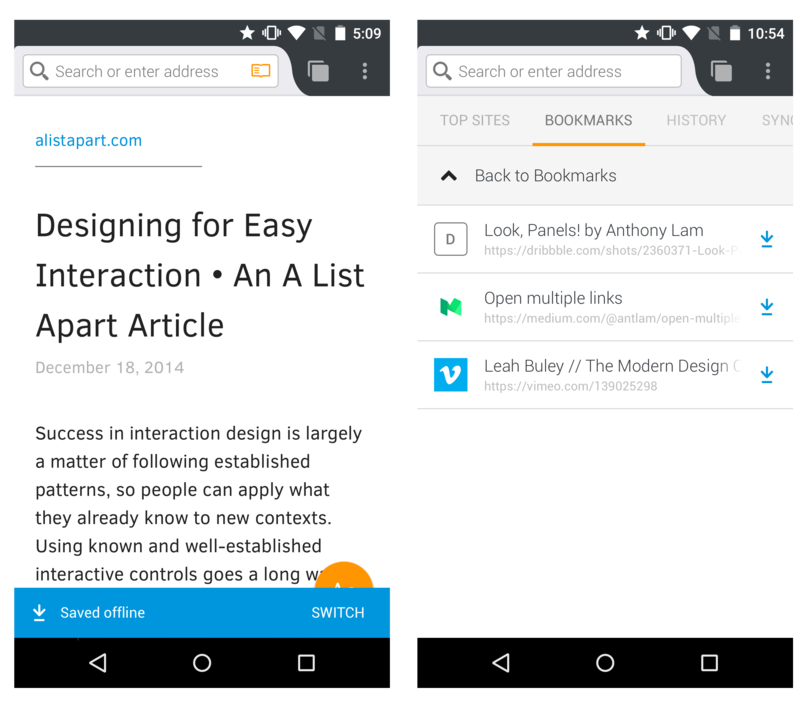 Once a page has been saved using the star button, the URL is added to the Bookmarks panel. 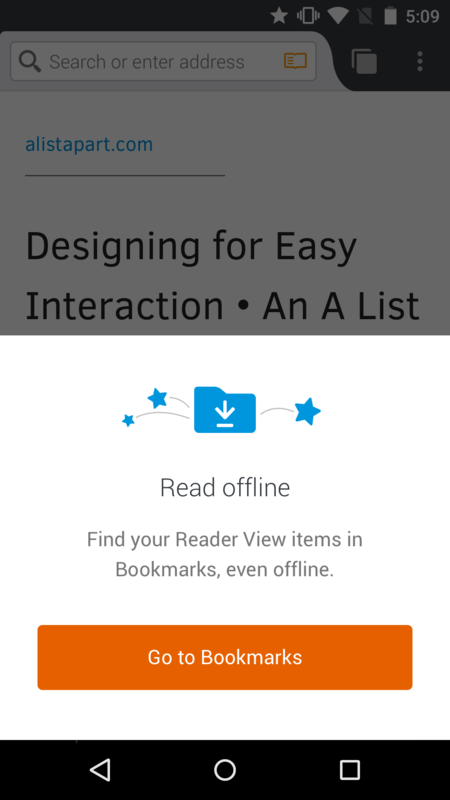 If the page is in Reader View at the time it is saved, we make sure to save the Reader View version for offline use. An “offline available” indicator for each saved article signals that the saved content can be revisited offline. Qualitative and quantitative data will help us make further decisions and adjustments, as well as help us in defining the success of this improvement. Feel free to follow our meta bug which outlines our current approach in more detail.